The exemplary Deco design from the heyday of the movement (1925) shows off the style in all its self-confident glory: elegant, bold, and optimistic. The years 1928-1929 saw the swan song of the Deco style, as if in anticipation of the coming economic crash. We see also the inspiration of Fauvism (1905-1907), where vivid colors and simple flattened shapes were the dominant motifs. The Fauvists ("wild beasts") emphasized painterly qualities and strong color over the representational or realistic values retained by Impressionism. 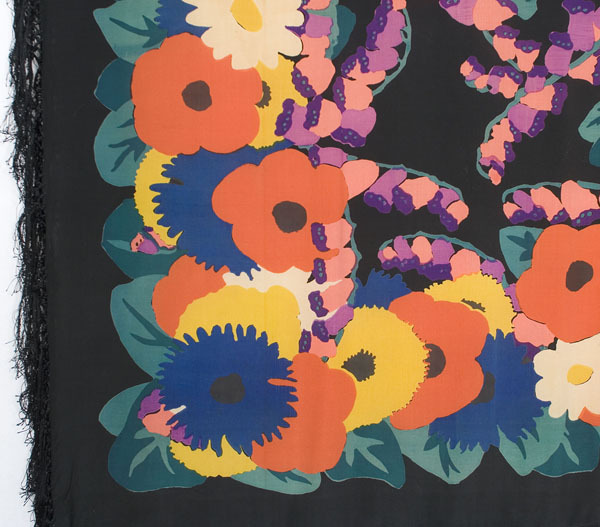 The splendid shawl is made from black silk crepe printed with larger-than-life stylized flowers. It is bordered all around with hand-knotted silk fringe. 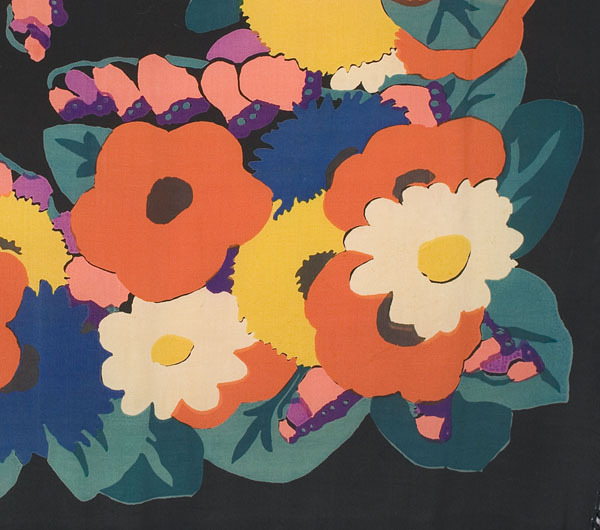 The term Deco is often confusing because it includes both floral and geometric (streamlined Deco) designs. The common elements are bold colors, large scale, and flat graphic shapes. The boldly graphic design plays variations on the geometric theme of the circle or disk. It is as if the great geometer Euclid had taken lessons from Pablo Picasso to design the shawl, which would find pride of place on any museum wall. 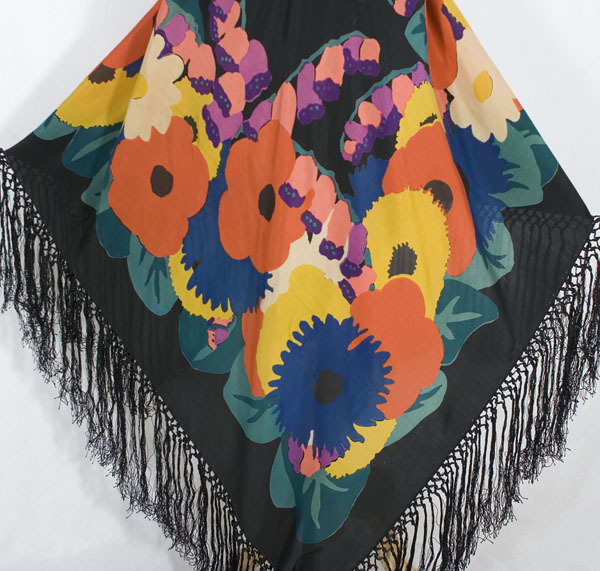 This type of shawl was a favorite flapper accessory. You could have seen it on the stylish women invited to Jay Gatsby's summer lawn parties at his Long Island estate (The Great Gatsby). 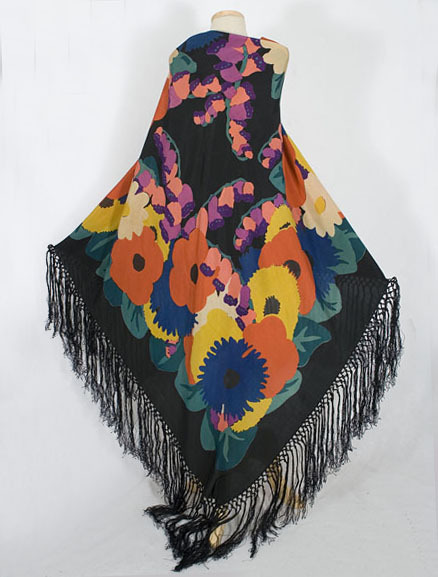 You can wear the shawl or drape it over your couch to admire the inspired design. 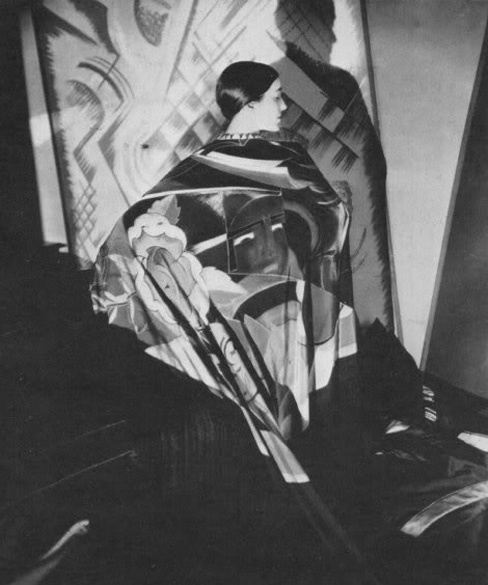 Below is a famous Edward Steichen photo in the Expressionist manner of a model in a Art Deco shawl like ours. 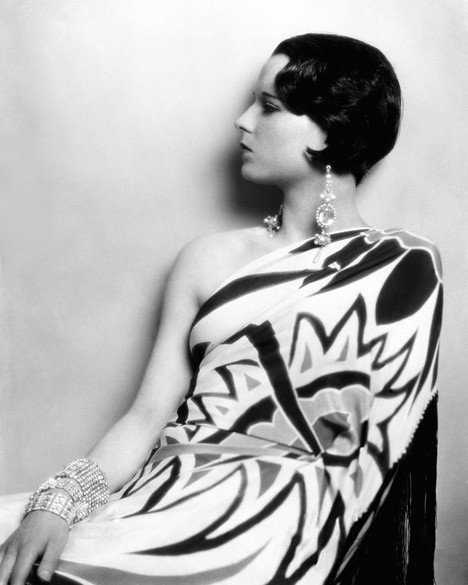 Below is famed screen star Louise Brooks in a late 1920s still, wearing a another dramatic Deco print dress. 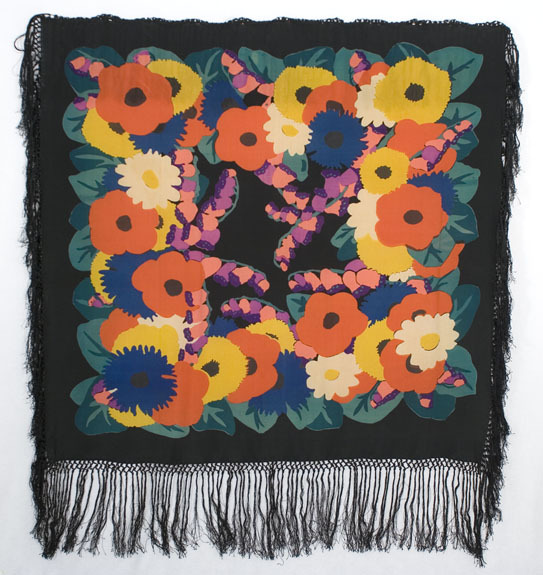 It measures 81" square, including the 12"-wide border of fringe.